Wayne Staab, PhD (Trends) was one of the first audiologists to work with manufacturers back in the 1970s and has a wealth of both historical and current knowledge. His perspectives are balanced and always well thought out. The other day I mentioned to an acquaintance that I was in the business of making hearing aid analyzers. His response, “You what?” Then I explained that hearing aids involve three primary operations: 1) they make the sound louder, 2) there is an upper limit to how loud they get, and 3) they always add various types of distortions. The analyzer measures these three parameters. I ended by stating the question that hearing aid analyzers try to answer, “Is this device functioning as it should?” Does it meet the factory floor specifications? (George Frye). Generally, two types of hearing aid analyzers are used: 1) A factory/research analyzer, and 2), an office analyzer (Figure 1). A number of different manufacturers of hearing aid analyzers have at least one type available. Figure 1. Hearing aid analyzers. Factory/Research model 8000 on the left, and office model FP35 on the right. Both instruments are capable of real-ear measurements as well. (Images courtesy of Frye Electronics). Providing gain and power output are not all that their designers attempt to make hearing aids perform. Fundamentally, their intent is to develop hearing aids that make speech easier and more comfortable to hear and understand, and in all sorts of situations/environments. Because hearing aids are small and located in and around the ear, the amplified sound they produce leaks around to their input microphone and tends to make them oscillate or whistle (Figure 2). This is not desirable. As a result, different sorts of “tricks” have been developed so that the gain can be made stronger before acoustic feedback becomes a problem. Figure 2. This illustrates the effects of sound transmission and leakage in a typical hearing aid. The acoustic feedback path is in red arrows and leads from the vent pressure leakage (Pv), back to the input microphone (M) where the feedback pressure (PF) is summed with the normal microphone input pressure (Pi), then through the amplifier (A), to the receiver (R), down to the earmold, through the vent – and then all over again. This illustrates an open feedback path1. Tsubscript describes the time elements involved. Other identified sound pressure areas include: PT (pressure at the tympanic membrane), PR (pressure from the receiver), and PO (pressure output of the hearing aid. Figure 3. Hearing aid operation in a crowded, noisy restaurant creates problems for hearing aid design where speech intelligibility is an issue. (Image: Ignite Hospitality Marketing). 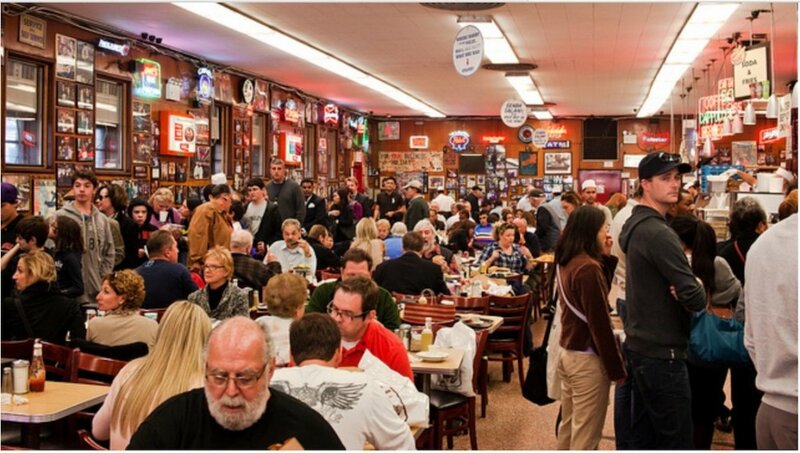 Acceptable operation in noisy environments is another problem for hearing aids to overcome, especially in crowded places like restaurants where everyone is talking all at once (Figure 3). Is it possible to improve hearing aid performance in such situations? The answer is Yes, and can occur in several ways. One method claimed by some manufacturers is that their products continuously monitor sources of noise and tune it out as it is perceived to occur. Do these methods actually work? Sometimes. Also, being able to understand what is said in a large auditorium with its multiple loudspeakers and numerous echoes can also be a real problem. Left out are a number of major amplification problems that hearing aid designers have attempted to resolve. Regardless, when all the various acoustic tricks have been programmed into the hearing aid that one is trying to analyze electroacoustically, the measurement analyzer’s test signal is sometimes seen as a distraction, and the hearing aid tries everything possible to reduce its effects. The question then becomes, “Do we want to measure the effects of the special programs or do we want to first test the underlying components that make up the hearing aid’s acoustical foundation?” It would seem that the latter is required to provide a baseline of performance. 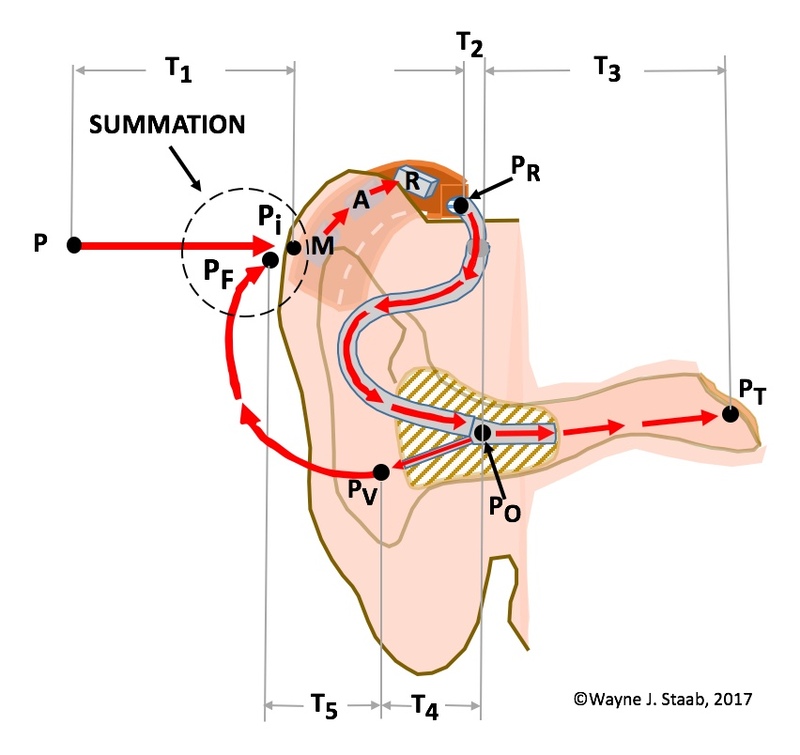 Or, should we assume that the hearing aid’s basic performance structure is sound? Manufacturers provide specification sheets for their devices. Can it be assumed that the hearing aid actually meets these basic specifications? If not, then what can be expected for any programming of that hearing aid? That this is an issue was reported in a recent study by Holder, Picou, Gruenwald, and Ricketts2. Of 73 hearing aids tested, their results showed that none were within the allowable tolerance for every specification, with the exception of Max OSPL90. Most instruments were within specifications for THD (total harmonic distortion), but not a single device was within specification for EIN (equivalent input noise – the noise floor of the hearing aid). Their results seem to be consistent with comments from Staab for ANSI measurements of hearing aids during comparison evaluations3. Further, it is difficult to even find how to program hearing aids from some companies to function as linear instruments for ANSI measurements in their programming software. And, some don’t even allow the software to set the instruments as linear aids for ANSI measurements3. The American National Standards Institute (ANSI), through working group S48 of the Acoustical Society of America, has the responsibility of keeping the hearing aid Standard up to date. The latest version of ANSI S3.22-20094 is the Standard used in the United States for testing hearing aids. The latest Standard states that when running a standardized test, the device first must be programmed to act in a linear mode. In other words, all the fancy tricks mentioned previously to manage noise, provide directionality, adaptive compression, etc. must be turned off; the hearing aid has to act as a simple, linear amplifier. That way, the following questions can be answered: Is the input microphone system working correctly? How about the controlling circuit? Is the sound output device, whatever it is or wherever it is located, producing clean sound with low distortion? Is the battery drain at a reasonable level? Does the magnetic pickup coil work? The hearing aid factory assembly line tests the hearing device before it leaves the factory to make sure that its main parts are functioning properly. And if so, its proper operation is assumed when special features are activated with a program change. In the past, an assembly of individual analog parts had to be assembled correctly for the amplifier to do its job. This assembly consisted of numerous small parts like resistors, transistors and capacitors to perform its function. This assembly of multiple individual components is no longer a problem with today’s digital hearing aids. Instead, a super complex and amazing digital circuit that contains probably over a million devices is handed the job of amplification. A program stored in the device determines what it does. It is literally a hearing computer. But, even for digital hearing aids Standards testing, the aid’s program is first set to make the hearing computer act as a straightforward linear amplifier. Fortunately, because the operation of digital devices is very uniform, tests of proper environmental function made on a clean predicate test device, should behave in a proper manner and transfer to other same models as well. The assumption is made that shipped products will perform as programmed. In order to meet the test Standard’s requirements, analyzers used on assembly lines or for research purposes have to be a step above those used in the field. These analyzers use precision measurement microphones with flat frequency response, low noise levels, and capable of accurately measuring sounds of up to 150 dB SPL from the most powerful hearing aids. The microphone measures its sound through a special coupler with a cavity volume that somewhat approximates the human ear, but is used for the intercomparison of hearing aids because it has a standard capacity (2cc). Sound from the hearing device is routed to the coupler through much the same type of plastic tubing or other connections used by the manufacturer for the hearing aid as worn (Figure 4). Figure 4. 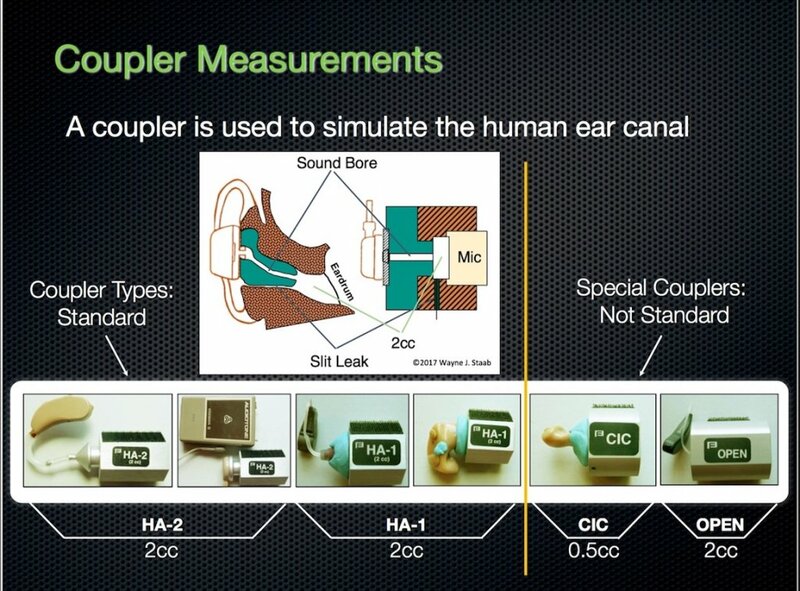 Measurement coupler configurations for hearing aids. These tests are typically run in a sealed sound chamber with controlled reverberation properties. The noise level inside the chamber has to be kept low for accurate measurement of the distortion and internal noise generated by the hearing aid itself. A special magnetic test device can be used to check the magnetic telephone sensitivity, or alternately, a coil system to generate an equivalent to a magnetically looped auditorium may be used, instead. Usually, less expensive versions of this type of analyzer are used in the offices of hearing professionals for quality control checks when new devices are received or when problems occur (Figure 1). To the best of our knowledge we are unaware of any analyzers intended for use in clinics or hearing aid offices that meet the requirements of ANSI Standards. However, some of the better clinics do use a factory/research analyzer, which does. The hearing professional has to remember that the hearing aid is a complicated hardware device. Many things could and do happen to affect the way that it operates. Sometimes, only by running an objective test is a defect found in what otherwise seems to be a perfect hearing aid. Hearing aids work just as they should, given the circumstances of their construction, programming, and the environment. When they start behaving otherwise, magic is involved. Staab, W.J. (2012). Hearing aid acoustic feedback. Hearing Health and Technology Matters, April 8, 2012. http://hearinghealthmatters.org/waynesworld/2012/hearing-aid-acoustic-feedback/. Staab, W.J. (2017). Personal communication, and based on ANSI comparison data over the past four years. American National Standards Institute (ANSI). ANSI S3.22-2009, Specification of hearing aid characteristics, Acoustical Society of America, Melville, NY. REPUBLICATION: Articles may be republished with permission of the Editor of HHTM. Please read our republication guidelines before submitting your request. Copyright © Hearing Health & Technology Matters, LLC. 2016. All rights reserved. George Frye founded Frye Electronics, Inc., in 1973, where he designed the FONIX 5000, the first automatic digital hearing aid analyzer. Later work included the 6500, the first interactive real time analyzer. He lately helped with the design of the FONIX Colt, which is the first type 1A clinical audiometer to use an Android tablet for the user interface. He served for three years as vice chair of the S3 ASA/ANSI Standards Committee and is a member of the AuD advisory council at Purdue University. He has served on the ANSI Standards working group S3/48, which writes standards for hearing aids. He holds a number of patents, and has written articles, book chapters and has given papers on hearing aid analysis.